Imaging the Story presents a window of opportunity in the busyness of life to stop, listen to, discuss and reflect upon different aspects of the biblical narrative. Exciting possibilities for personal and corporate responses unfold as examples of biblically inspired literature, poetry and art are considered. 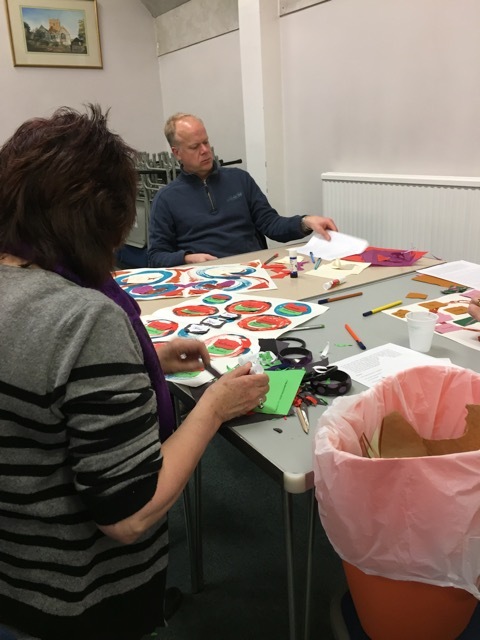 There is a practical element to each session which is focussed, yet relaxed and great fun, providing an opportunity to explore words, objects and art materials in a prayerful way and then to use them creatively in response to a given theme. The culmination of this motivational and inspiring course is a rich and diverse exhibition of students work. Imaging the Story definitely encourages individuals and groups alike, to move with a more considered and creative mindset, in seeking to prayerfully interpret and express the truths of God's word. This has the potential to affect and enrich one's personal faith journey and that of small groups and our church communities. The exciting prospect of Christians expressing the Gospel in creatively diverse and engaging ways is the impact that this could have in our wider communities! In Autumn 2017, I used Imaging the Story as the focus for a fellowship group I run: ‘Word for all’. I chose to use this book as it gave the group an opportunity to see the Bible in a different way. I used the leaders' notes as an outline, along with the chapter contents. The group was mostly elderly and would not be up for reading the chapter themselves or doing all the art work, thus I adapted the course to work for them. Each week I picked out the key texts mentioned in the book, the key art work, and the key discussion points. I also added further art work to encourage conversation and perspective. Ask a question: What do you think this scenario looked like? Look at three images relating to the Bible reading. We used questions from the book to create conversation or simply asked which image they liked the most and why or how they relate to that image personally. We would then move on to the next biblical text mentioned and look at the pictures related to it. Where necessary I would use some of the explanations in the book to communicate why certain pictures or imagery was significant. These sessions were simple, and I used the topics mentioned in the book. Those who attended loved it and loved seeing new ways of interpreting the Bible. I purposely did not tell them when and who the images were made by because the group had a habit of turning the session into an Art History lesson, which I wanted to avoid. Once we had finished the chapter topics in the book, I ran one last session to encourage participants to be creative. I wrote the key things we had discussed in each session and asked each person to create a piece of artwork from the session that had stood out most to them. Though this book works excellently following the guidelines prescribed, it can also work well in a smaller group setting with fewer resources if you are willing to adapt the book as I did.